Hello all! Hope you're all doing well! Baby boy #5 will be joining this world in about 4 1/2 weeks or so and I've been busy "nesting" and trying to get ready for the little guy! I can't wait to meet him! Not to mention that I'm SO ready to be done being pregnant. With that being said, it was time to start changing some rooms around in my home to create a new nursery. So... for the past couple of weeks, I've been doing just that. 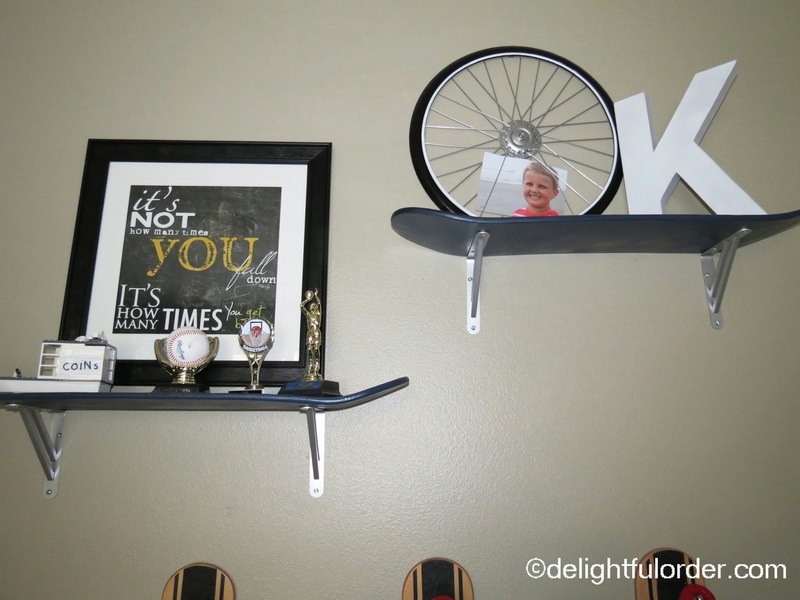 Today, I'm sharing my second oldest son's skateboard themed room, before I took it all apart to turn this room into the nursery again. 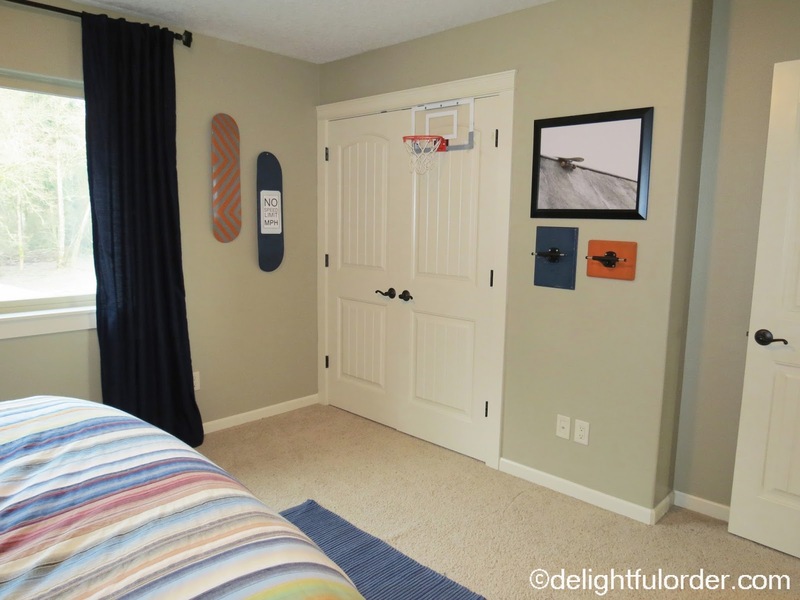 He totally loves skateboarding and many different kinds of sports, so I created a skateboard room. This room was the nursery a while back. It's been different now for at least a year or more. I just never got around to sharing it with you until now. The bedding, rug and curtains came from my oldest son's room. That 'World Traveler Room' is totally different now too. It's now more of a music room, because my oldest LOVES music. 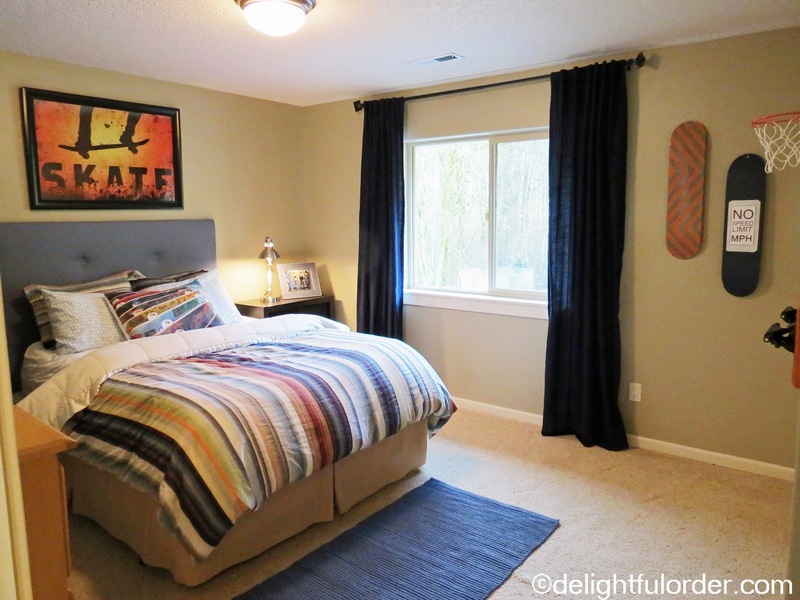 The skate poster above the bed is from All Posters.com. It's this one HERE, but mine is much larger. You can find all kinds of Skateboard Decor in my Amazon Store. 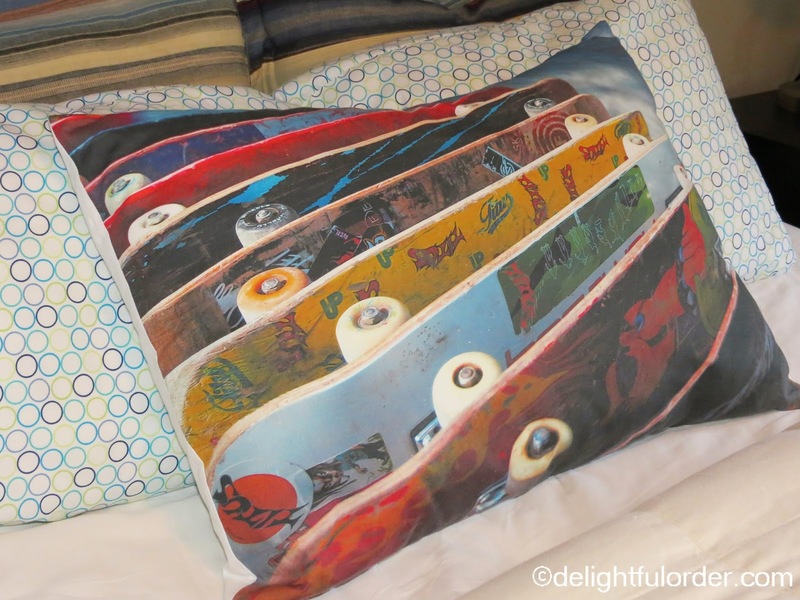 The skateboard pillow sham is from Pottery Barn Teen. The pillowcases behind are from Walmart. 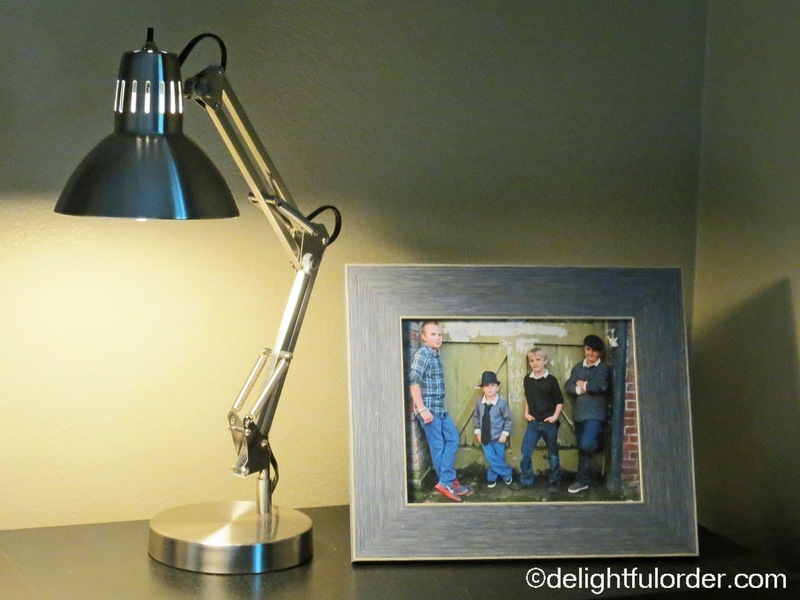 The lamps are from Target. 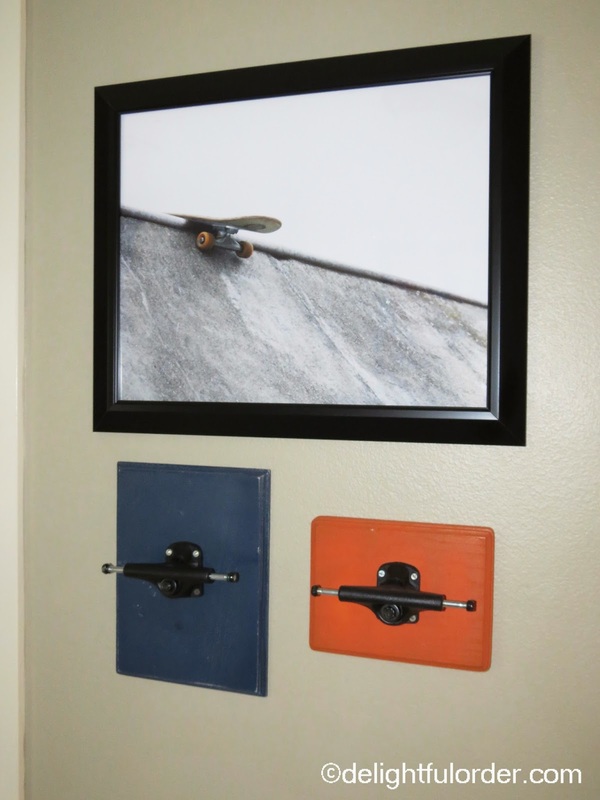 The skateboards on the wall were inspired by Pottery Barns' Skate Deck Wall Art. 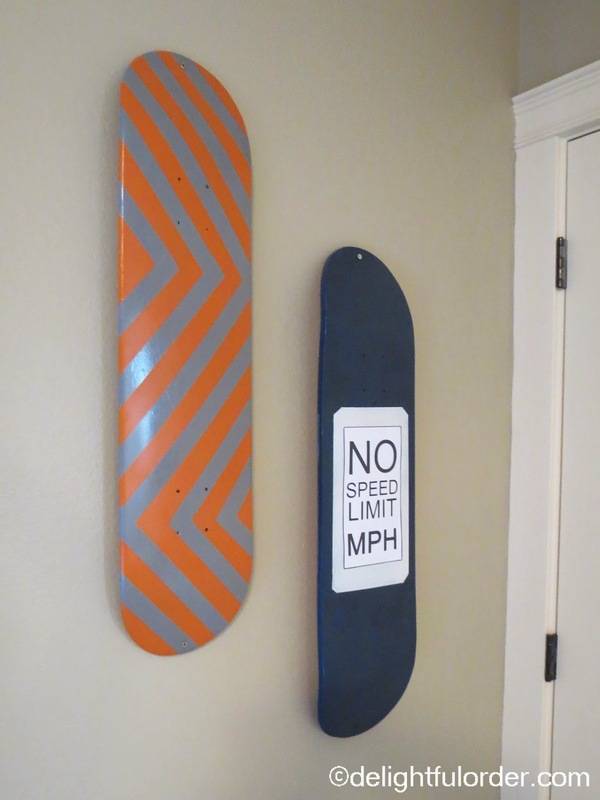 For the hooks, I spray painted boards & added the wheel tracks (or whatever they're called) from the skateboards that I took apart. 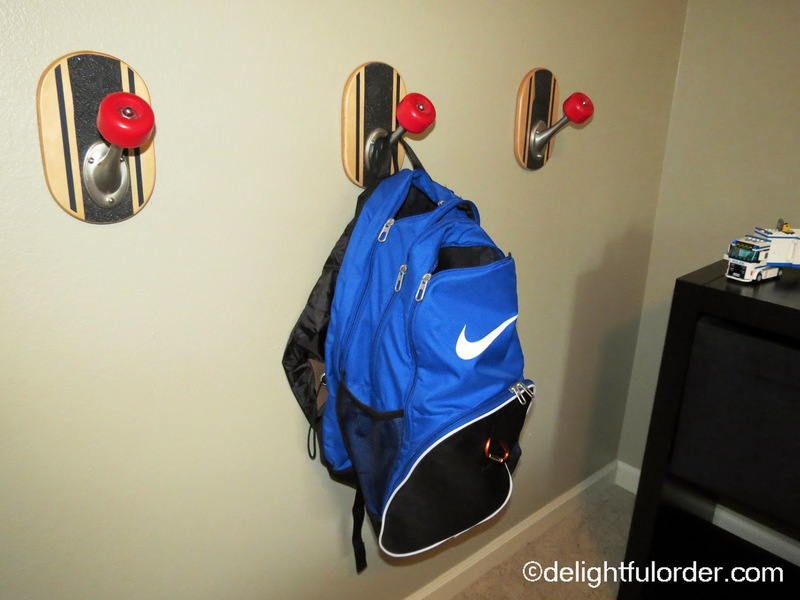 ... and made skateboard shelves. I bought these hooks from a friend. They're from Pottery Barn from quite a few years back. I don't even know if they sell them anymore. Today.. this room looks NOTHING like this... It is now the new nursery. I'm almost done putting it all together and when I finish it, I do hope to share it with you. Before I get to showing you what this room looks like now that it's back to a nursery, I'll show you where I moved this skateboard room. I shared parts of the toy room with you in the past. That's where my second oldest was moved to. At the end of this week or the beginning of next week, I hope to share all the photo's of what the toy room looked like before it changed too. 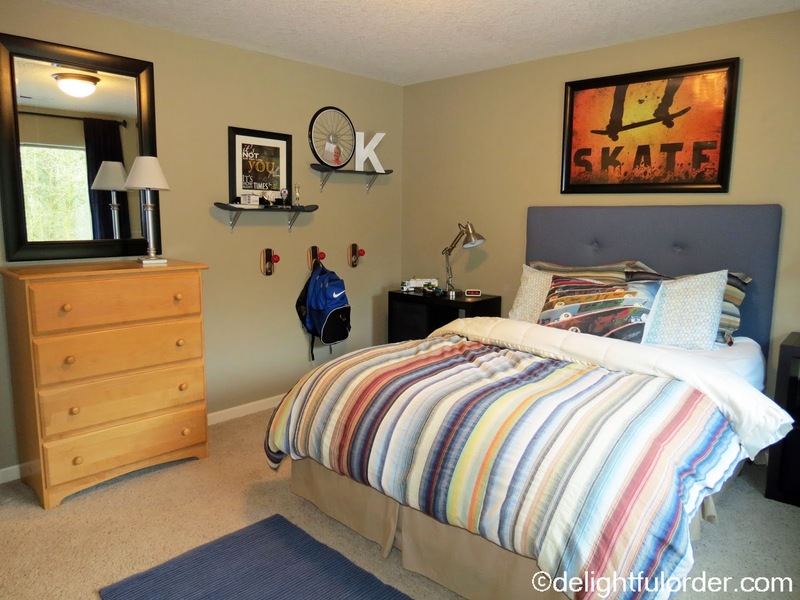 Great job on the room, love the wall hangers, very creative. i bet your son loves it! How creative with all of the skateboards! 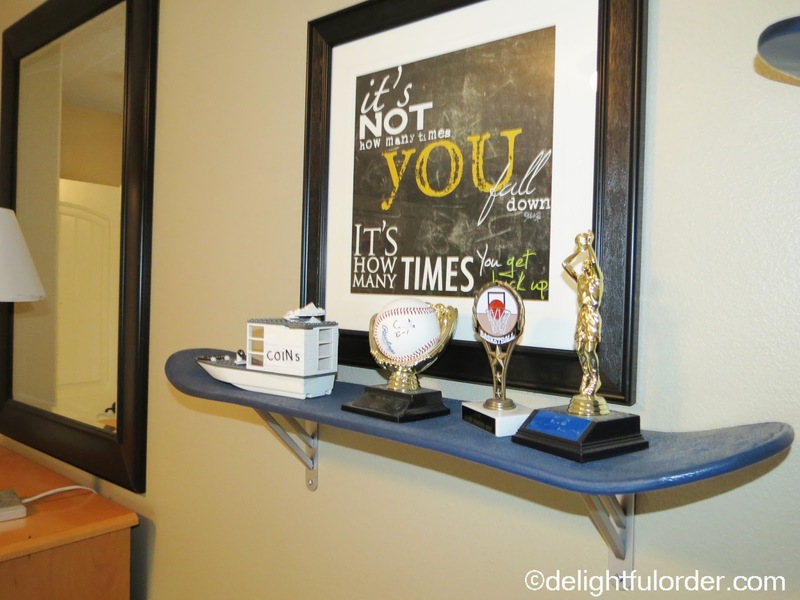 I love that you made shelves out of them as well as all of the decor pieces. Wow. 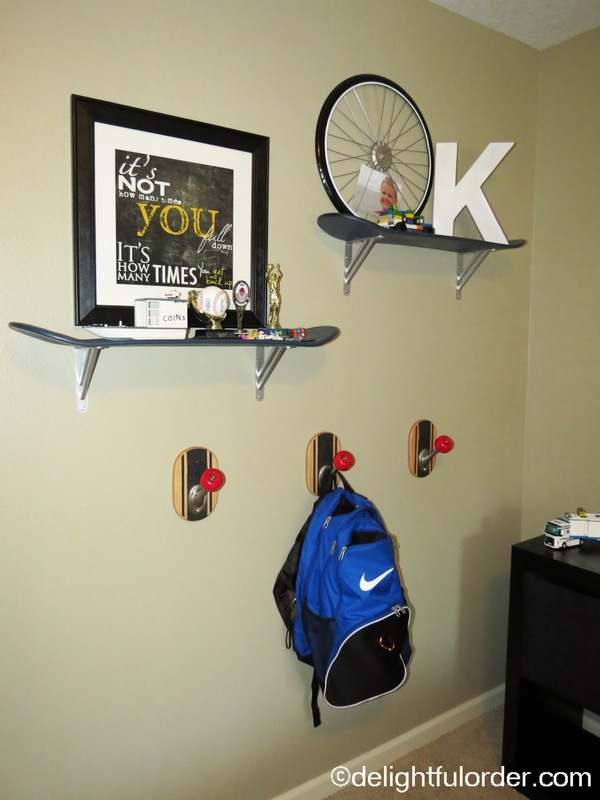 Those skateboard shelves and hooks are fantastic. The whole place is really. Love it! 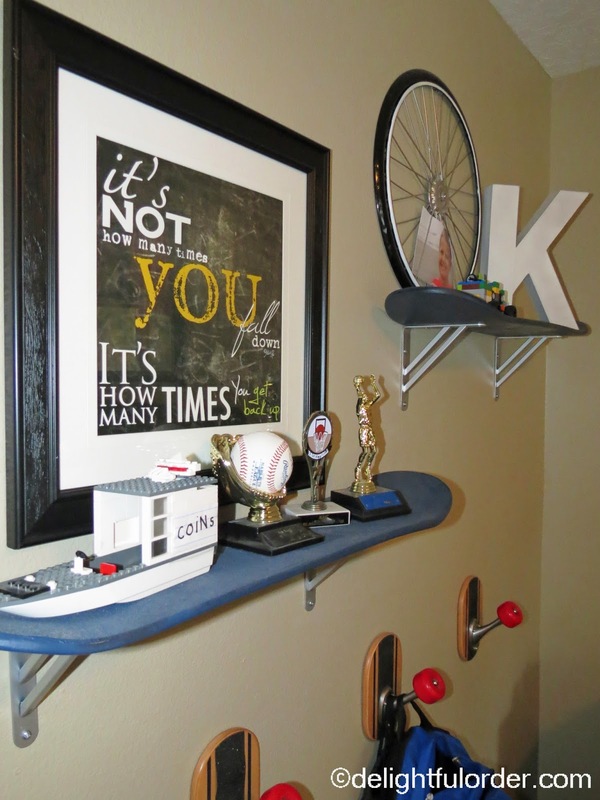 I love the creativity used to make the shelves and hooks!!! fantastic ideas!! So cute. Can't wait to see the new rooms! wow, lots of changing around with boys growing up and new ones coming! Fun tho, hey? Room looks great! I love all the skateboards you added to the decorating. Can't wait to see the nursery. Have you got photos of the other room....the music room - that's how I am looking to do my son's room - music themed and looking for inspiration!